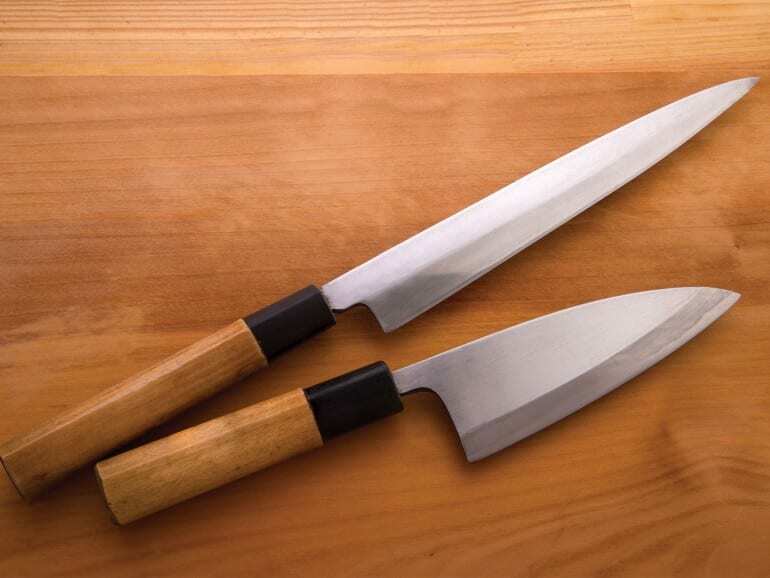 Every Japanese chef worth his salt has his own set of hocho knives, but they are also handy tools for home chefs. When it comes to making knives, the Japanese are second to none and, the hand-forged hocho knife is undoubtedly one of the most important tools in Japanese food preparation. The hocho knife offers a razor sharp cut that helps these foods retain their juices and natural flavours. Chefs are known to take along their own set of hocho knives when they move to another restaurant. Sometimes, chefs even have two sets of hocho knives. This is because when they sharpen one set, they will let the knives “rest” for a day or two so as to not let the metallic flavour of freshly sharpened knives to seep into the food. As Japanese hocho knives are usually made with far harder steel than European-made knives, they should not require any force from the user, cutting under their weight alone. As such, hocho knives are actually far safer options than knives made elsewhere. The blades of hocho knives are traditionally forged in multiple layers, with carbon steel interspersed with tough iron to ensure ultimate sharpness. These metals are hammered until they form the perfect shape. It should come as a surprise to no one that the hocho knife’s structure was inspired by the famous katana sword, and many of the hocho knives that come out of Japan today are made in Sakai, Osaka, which has been the capital of samurai sword manufacturing since in the 14th century. Most Japanese knives are single ground; that means, that they sharpened such that only one side has a cutting edge. That’s because it’s believed that a blade angled only on one side cuts better and cleaner. However, more skill is required to use such a knife, compared to one with a double-beveled edge, even though the latter have become increasingly popular since 1940s. There are many variants of the hocho knife. The most common one is the santoku hocho. Santoku means “three uses” and here, they refer to slicing, dicing and mincing. These multi-purpose knives are great for home cooks, as well as professional cooks who have limited space at their stations. The Deba knife – a single-bevel variety – is one used by a sushi chef to fillet fish and slice the boneless meat. There are various sizes of the Deba knife – choose one based on the size of the fish you handle most often. There are also hocho knives made specially for sushi, vegetables, and even different types of fish. Although handling a hocho knife might take some getting used to for those who have been using double-bevelled European knives, fans of hocho knives have said that it’s hard to go back to using ordinary knives once you’ve grown accustomed to them. So why not try using these amazing tools for yourself?